Why choose one way to save on your food shopping, when you can save in so many more? During the October savings challenge, I’m making small changes each day, aiming to spend less, earn more and save a chunk of cash towards Christmas. On Day 7, I nipped round our local Co-op before meeting up for coffee at the front of the store. I didn’t buy much, but it’s a great example of how lots of small changes all add up. The main reason I dived into the Co-op was to claim a free bar of Green & Black’s via the Shopmium supermarket cashback app, an offer I discovered on Day 4 of the savings challenge. Turns out there’s nothing quite like free chocolate to send me on a money-saving mission! While I was there, I thought I’d check out the reduced sections, looking for cut-price yellow-stickered bargains, as described on Day 5. I found some half-price ham, which I needed as a topping for home-made pizzas that night. Fridays are movie night in our house, when we eat pizza and watch a DVD from the library together. By making our own pizzas (recipe here), we can choose our own toppings, use up odds and ends from the fridge, and save cash compared to a takeaway or even a supermarket pizza. I also picked up a yellow-stickered half-price pack of four teacakes, down to 39p. I pack snacks like multipack drinks and crisps plus a couple of teacakes or hot cross buns when I take the children to their swimming lessons. They’re always starving afterwards, and it diverts demands from the expensive vending machine. If I freeze the packet, I can take a couple one week, and a couple the next. 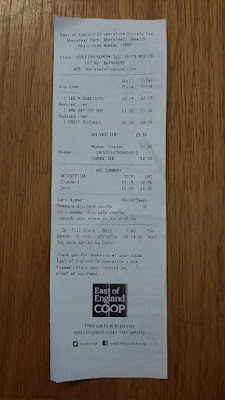 The total came to £3.58, so I was able to pay with a supermarket voucher as described on Day 3. I used my last £4 Co-op dividend voucher, which unlike most vouchers will actually pay out some change when used for a smaller amount of shopping, so I got 42p back. 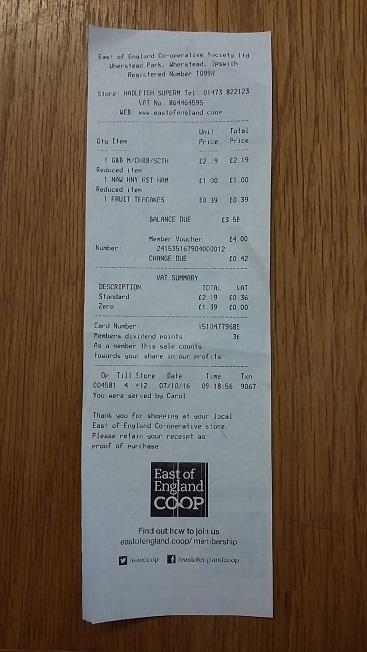 As an added bonus, on Fridays our local East of England Co-op offers free fruit to kids. I checked with the lady at the till, and took home a couple of pears for my children. Ta dah the receipt, if proof was needed! However, I paid with a voucher, got 42p in change, and Shopmium have since paid the £2.19 for the chocolate into my bank account. meant that rather than spending £5.57, I made a profit of £2.61. As an added bonus, the shopping and submitting the receipt to Shopmium all took distinctly less time than writing this down! 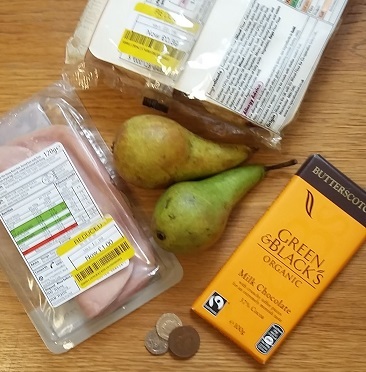 So at the end of the first week in October, my savings challenge has made nearly £50 difference, and that’s without adding any savings from yellow-stickered food. The vouchers help with spending less, rather than adding anything to a savings balance. However, I have stashed away nearly £30 in cash from saving more and earning more, just by making small changes each day for a week. How do you combine different money-saving measures to cut the total at the till? Do share your ideas!